DH and I have gone through the motions every year – not wanting to deprive R of an occasion that was so important to all children his age , yet suspecting that it meant nothing. And so we asked his therapist to show him a list of flashcard of "career people "
"Cant believe I paid 40 bucks..luckily its big enough so he can wear it for the next few years "
But in the morning R keeps wailing and crying " no school .. no school "
Oh how fast the tears vanish . R is absorbed in the intricacies of using "ou" and "ow" in words on a video he has found on youtube and tells me "no costume "
Luck is on our side and in our first stop is Lucy and she not only makes a huge fuss of him but also has his favorite candy "blue raspberry dum dum"
And at the end of each visit he crows "more trick or treat"
I believe L will do everything, but in her own time. I don't mind … she can take all the time she needs … but I have faith she will do it all." That is absolutely awesome!!! We have the refusal of candy too which I think is welcomed by people versus the kids who try to grab fistfuls!! Awesome! Who cares if he is 6 or 60! As long as he had fun. 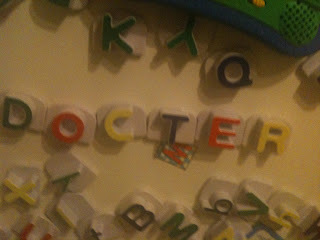 i love how he wrote "Docter" on the fridge. R is amazing. so happy that all three of you enjoyed Halloween! beautiful. what a happy halloween. Baby's First Halloween...love it! And sooo true. Sometimes our kids are a little late to the party. Audrey would have had bad associations with doctors after all of them that she's seen. So cute that he got more into it after seeing the other children...bravo! Love this! I'm so glad you all had a good time! That is so great! I almost brought the girls by to see if you guys were participating in Halloween this year, but I was afraid that by the time we made it to your house, they would be over it and I would have to drag them down the street. :) I'm so glad that he had a great time!! Oh I am so glad he had a good time! 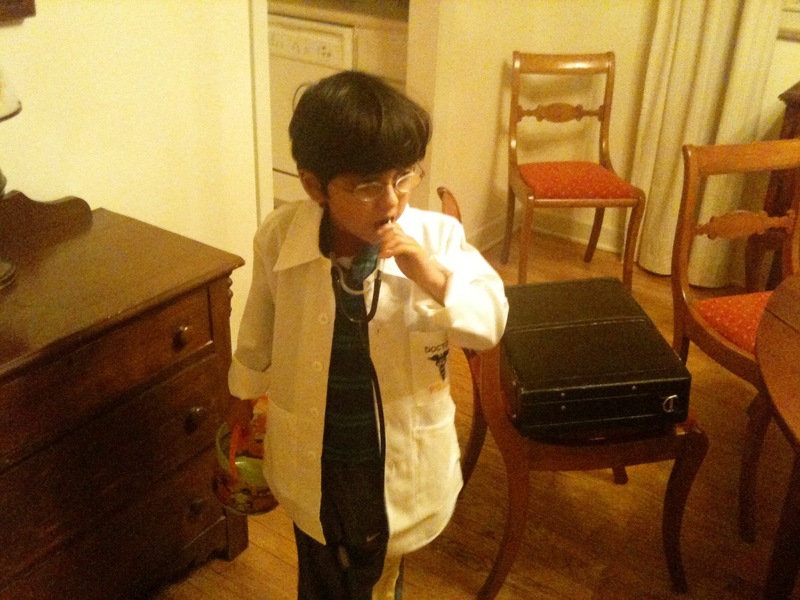 He looks marvelous as a doctor! In your usual word for R: Perfect! We're gearing up for Guy Fawkes night - meaningless to Americans! Yay!!! So glad he wore his costume and had a great time :). I love how your friend put it, that our kids will do everything in their own time. That's been our experience too. This part "DH and I have gone through the motions every year – not wanting to deprive R of an occasion that was so important to all children his age , yet suspecting that it meant nothing. I love the title of this post. And how well he understood once he understood! AND, how unbelievably darling and fitting that costume is for him. we leave Halloween costumes out year round for pretend play~hang it on a hook and see if he'll play! Those dress up clothes are a favorite of friends who come over to play. Career outfits are perfect! Awwww....Congratulations on your fist Halloween R! You made a lovely doctor. oh, I loved this!!! Happy Halloween, R! !